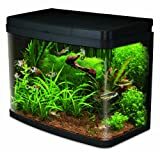 Looking To Buy A 40l Fish Tank? If you are looking for an aquarium to introduce your kids to then a 40 litre fish tank is the perfect size for children. They are large enough to hold a decent number and variety of fish, along with all the decorations and equipment that go with them. Children are often easily bored and giving them a large enough tank that they will be able to sculpt their own miniature world will be a great step in helping to hold their interest and increasing their enjoyment. At the same time, a 40 litre fish tank is not so big that it will require an overabundance of support equipment or involve a great deal of work to keep up with its required regular cleaning and maintenance. Nothing will destroy a youngster’s interest faster than making it too big of a chore to take care of. When looking at buying a new aquarium you have to ask yourself a few questions before you get started. What sort of fish would you like to keep? How big a space do you have? Do you want a glass or acrylic tank? What sort of filter will you need? What sort of lighting will you need? filter system is large enough. These kits are designed by aquarium professionals to be about as fool proof and worry free as they can be. However, if you buy a tank alone, you will also need to purchase suitable support equipment to go along with it. You will need a filtration system with a high enough flow rate and the sufficient capacity to keep the water in your tank clean and free of waste. You are also going to need appropriate lighting. As a general rule, you can figure the proper power of your lights at one to two watts of light, per litre of water in your tank as being more than sufficient. To heat the water to the correct temperature for tropical fish, 24 – 27 degrees centigrade (75-80 degrees Fahrenheit), you will also need a suitable heater. There are differing opinions on what is the best way to set up the heaters in your tank, with some people believing it is better to use two smaller heaters rather than one larger one. And, some believing it is better to place heaters closer to where your filter return feeds into the tank for better circulation, while others say this creates stress on the heater’s glass casing. There are pros and cons to all of these arguments and what will work best for your aquarium is largely a matter of taste. Aquarium Sand or Gravel – This comes in a huge variety of colours and textures so you can create just about any type of effect that suits your or your child’s fancy. Plants – Live plants are better for the tank because the help clean the water and maintain oxygen levels but fake ones can be more colourful and vibrant for children to view and are more easily swapped out as your child develops the tank into their ideal vision. Ornaments – There is no end to the variety of ornaments and figurines that you can find for your child’s aquarium. There is now a trend for theming your tank with lots of different options available. Themes like football teams, TV characters, unicorns, and aliens are very popular right now, but it is hard to go wrong with the timeless classics like castles, scuba divers and treasure chests. Thoroughly wash everything that is going into your tank including the gravel. DO NOT USE SOAP OR DETERGENT. These are highly toxic to fish, just rinse with water until clean. A large strainer or colander is a great help here, but not a necessity. Put your gravel into your tank. Place a saucer in the bottom of your tank, this helps keep the gravel from being flushed around as you add water. Fill your tank about one-third full of water by pouring water onto the saucer. Hook up your airlines and other equipment then arrange the plants and figurines in the bottom of your tank. Finish filling the tank and let sit for three days before adding fish. This time is needed for the water gas off its chlorine content. There is a plethora of fish available for your child’s new tank, but the 40 litre fish tank will only hold around 13, 3cm adult length fish and some fish prefer to be in small groups, others alone or in large groups. So, remember to take this into account when choosing. All of these species are fairly rugged and will be easy for your child to take care of. 45 litre fish tanks will hold around 15 tropical or 7 cold water fish of 3cm length at adulthood. 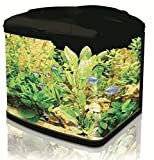 This makes it one of the smaller tanks around on the market, and one that is extremely suitable for a beginner’s first tank or a child’s first tank. Set up of a tank this size is relatively simple, it is even possible to buy kits that will include everything you need. 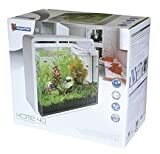 If you choose to buy it separately though bear in mind you will need a light, heater and filter system suitable for 45 Litre Fish Tanks and a heater if you wish to keep tropical fish. Before you can even consider buying fish a tank needs to be set up and left to settle for around three days. What you need to do this may vary dependent on whether you are going for a tropical or cold water tank, it is best to consult a professional for advice. Once you have decided on the type of tank you wish to run it is time to think about how you want it to look. Themed tanks have become increasingly popular and there are many out there to choose from including the fairly obvious ship wrecks, beaches etc. But if you’re looking for something a little different why not try a space theme? This can be achieved really easily and very effectively even down to picking alien like fish. This is why 45 Litre Fish Tanks are so popular, they are easy to change depending on your mood or room design. First pick some substrate (gravel) in a range of funky colours and mix it together before spreading around the bottom of your tank. Next choose a mixture of live plant and fake plant to decorate your tank. Live plants are usually of a more sedate colour than the shocking pinks, purples etcetera that you can get in the range of fake, but they do produce oxygen and absorb carbon dioxide and ammonia keeping fish healthy. Mixed together with funky bright fake plants the more sedate real ones will look pretty cool. Finally add some rock caves and floating rocks. Available from a variety of websites the floating rocks will make your tank look very space like and they are easy to install. Leave your tank ready to go for around three days. After three days go pick your fish. Some good suggestions would be the celestial, bubble eye or lion head goldfish. These are all strange-looking fish with weird shapes and strange eyes. Others include the hatchet with its scary looking face, the colourful butterfly fish, elephant noses, Celebes half beaks and needle nose gars. All alien looking fish in a space like environment – very cosmic!